This is a big part of the newsgroup. Participants seem to love sharing stories of their amazing finds. On April 11, 2000, Jerry Morris exclaimed about a recent ebay purchase, even giving a link to a webpage he had constructed simply to show off his new acquisition. Here's the RCB thread in which I "exclaimed" about my ebay purchase: three books about Samuel Johnson's journey to the Hebrides. Before I ever had my six blogs to write about my books, I had five WebTV websites to display my books. 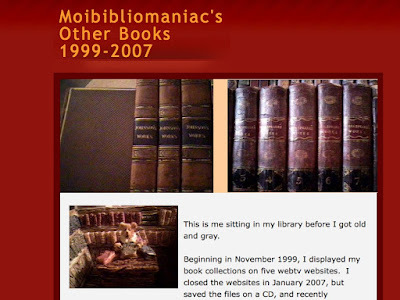 I constructed my first WebTV website, Moi's Books About Books, on Nov. 21, 1999. A word about WebTV here: my TV served as the computer monitor. The system was relatively inexpensive —but slow! Dialup! 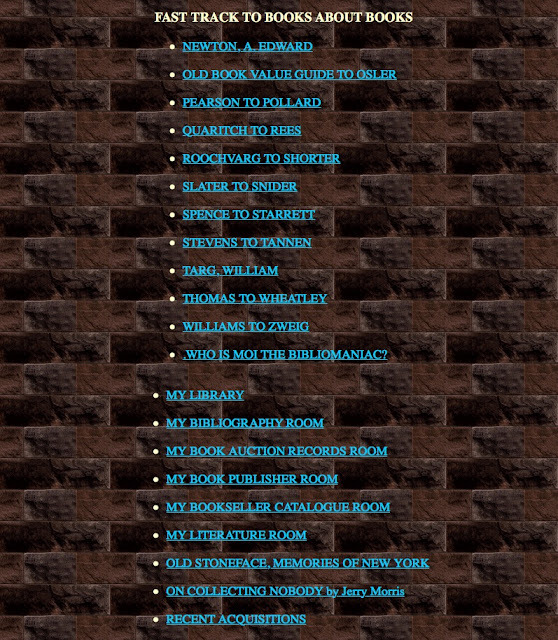 My library—at least on the web—was housed in a virtual brick building. My Books About Books Collection took up much of the space of the center floor. Along each side of my library, separate rooms housed my many other collections. Moving around my library was easy. 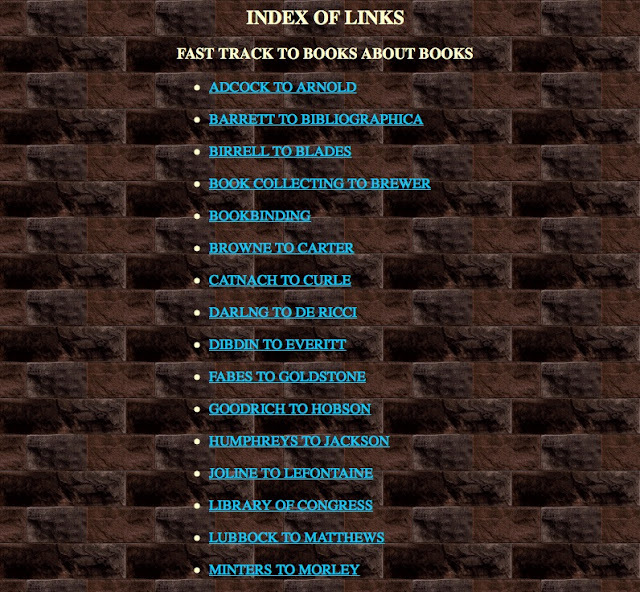 I created an Index of Links—a Fast Track—to transport visitors to any which room they wanted to explore. My heart was really into my books. I not only enjoyed collecting them, I enjoyed displaying them on my websites. But then the brick walls came crashing down. 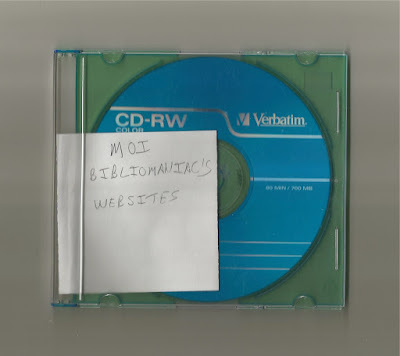 Before closing my WebTV websites, I downloaded them via Quadsucker.com to a computer, and eventually, to a CD. In March 2013, I attempted to recreate Moi's Books About Books Rooms and Moibibliomaniac's Other Books on Weebly.com. The first was a failure, but you will be able to view Moibibliomaniac's Other Books later in this blog post. And now you will be able to view Moi's Books About Books Rooms! 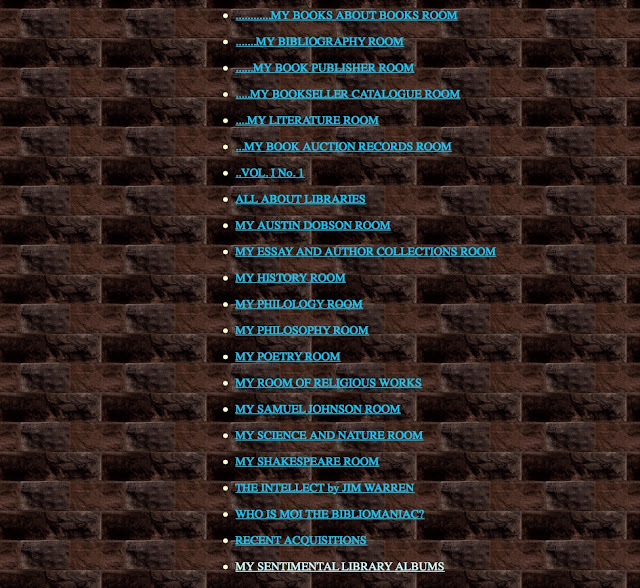 I have converted the html files to pdf files, merged the pdf files, and then embedded them in the "Rooms" below. But in order to view all the files in each room, you will need to either "Scroll Down" or "Pop-Out." The Pop-Out is in the top RH corner. I recommend using the pop-out feature to view the "rooms." Stevens to Who is Moi the Bibliomaniac? I sold many of my books just to keep me out of the poor house while waiting for my disability retirement from the Post Office to be approved. I was able to keep my Books About Books collection basically intact. But not so for my other collections. 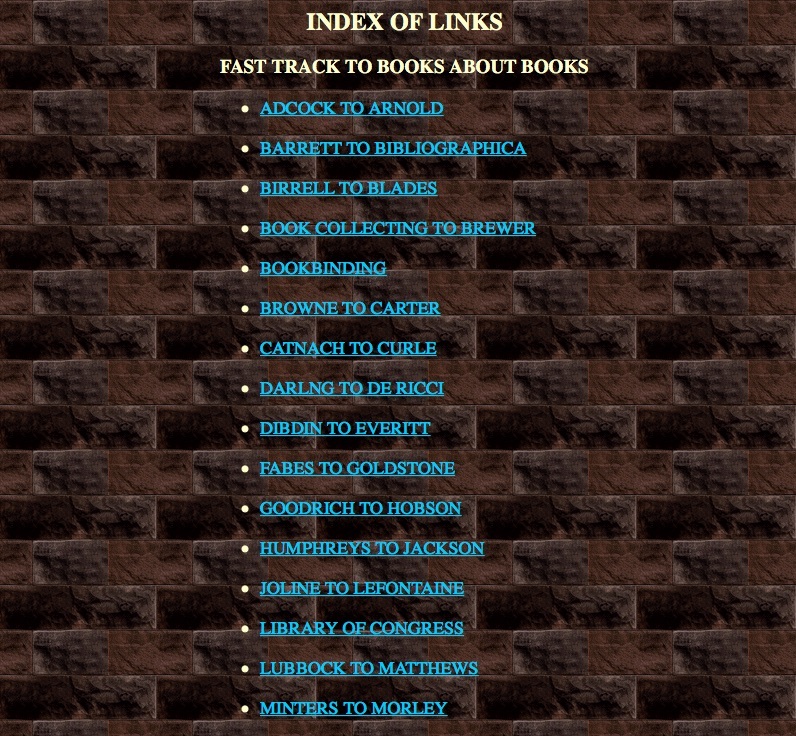 More than a few of the books displayed in the hyperlink below are now in other people's libraries. It took me five months but I finally realized that I could not walk away from my books for good. Books were in my blood! 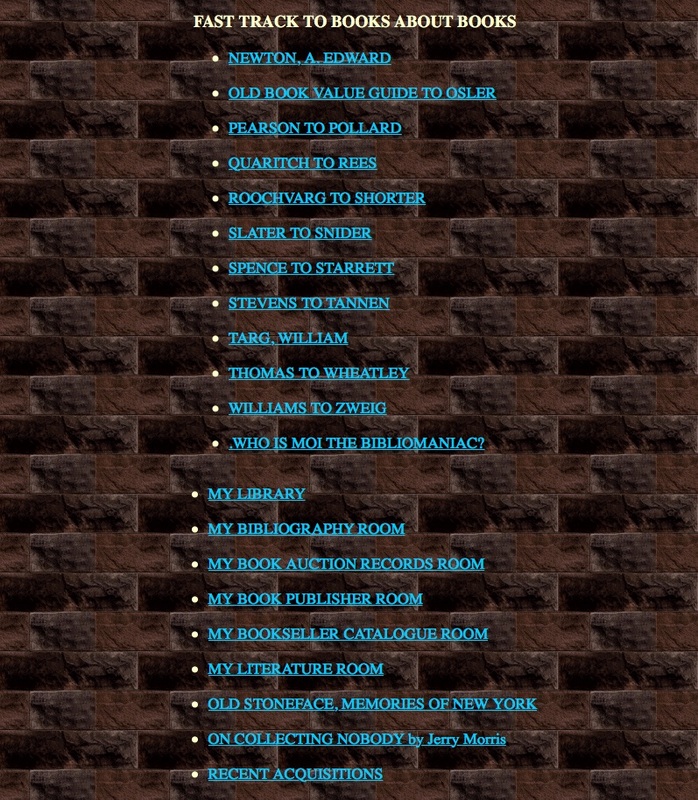 On Tuesday, May 29, 2007, I started writing about them in my first of several blog posts as The Displaced Book Collector! And now I can look back on my WebTV websites.